After three decades in business, Dion brings not only a wealth of experience but also an entrepreneurial spirit and a passion for enterprise. The appointment of his company as Management Consultants allows all his experience to be used in the development and expansion of Liveras Yachts. 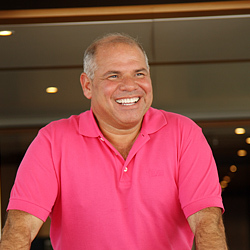 He travels to Monte Carlo regularly and will be responsible for offering advice on all commercial and marketing matters for the company and management advice for the existing fleet of superyachts and the build of the new Superyachts, as well as to assist in the development of new ventures. Dion joined the family business, Fleur de Lys Patisseries at the age of 18 where, after seven years learning all aspects of the business, his drive and business sense earned him the post of Managing Director. After steering Fleur de Lys’s successful growth, Dion then oversaw it acquisition by the luxury group company Grand Metropolitan. Always seeking new challenges, Dion then founded Laurens Patisseries, now one of the UK’s leading producers of chilled patisseries for major retailers throughout the country. After taking Laurens from a start-up to a nationally recognized supplier of supermarket own brand products, the business was sold in a multi-million pound deal to the Bakkavor Group in 2006. With Dion’s family background it is no surprise that he is fluent in English and Greek and a qualified pilot. What is a surprise is that he still finds time to be a keen golfer with a respectable handicap.